The wine is almost black, and deep. It reveals a complex bouquet, though still restrained by the wine's youth, and exudes powerful, fruit-laden, spicy notes with a hint of mint. The wine is generous, silky and very well balanced on the palate, and gains structure from the extremely fine-grained Cabernet tannins, which envelop the palate and are present throughout the tasting. 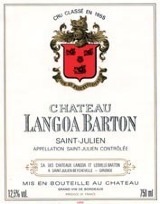 The body, structure and freshness of the wine are remarkably wellbalanced, and add to the exceptionally long finish. An extremely elegant Belgrave wine, born of a vintage of great ageing potential. Ripe and fleshy, with lots of roasted vanilla bean and fresh espresso, followed by dark, winey cassis and blackberry fruit. An intense licorice edge and a solid, tarry finish imparts drive. Best from 2014 through 2023. As Belgrave improves each year, it reveals a character that is close to the elegance and style of Saint-Julien, right next door. This 2010, while dense, is balanced, and its rich blackberry flavor is already integrating into its firm tannins. This should age well for the medium term.